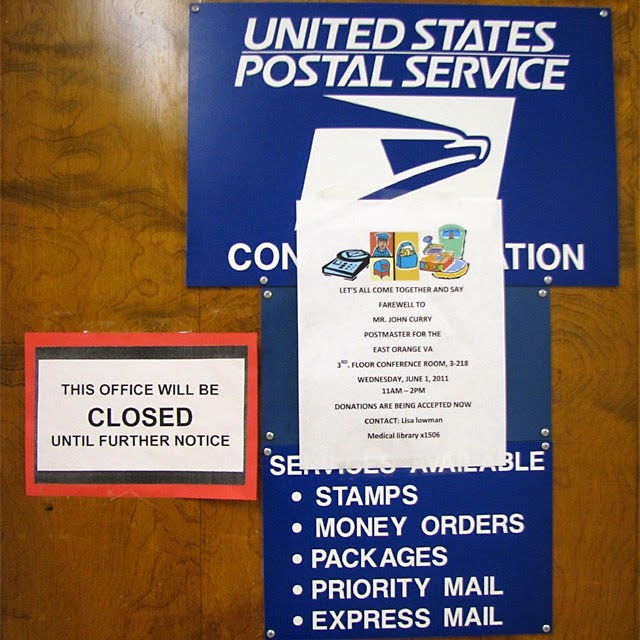 Exploring the Poconos in 2011 I came across this flyer at the Pocono Pines post office. It beautifully demonstrates what long-serving Postmasters mean to the communities they serve, particularly in rural areas. I'll let this invitation to a retirement party thrown by local residents speak for itself. It is with due respect and appreciation that we wish to recognize the 23 years of pleasant and committed service Fred has provided to over 1,000 postal patrons. His smiling face, friendly service and the personal attention extended to each one of us, made mail pickup a pleasant occasion. We are sorry he is leaving but honored to have had this gentleman as our Postmaster these many years. In his honor, a social and dinner evening has been planned, at which time we can pay our respects, offer our thanks and wish Fred and his lovely wife Judy, many happy healthy years of retirement. "Let's all come together and say farewell to Mr. John Curry, Postmaster for East Orange VA. 3rd floor, conference room 3-218. Wednesday, June 1, 2011, 11 AM - 2 PM." When I was younger I recall our block throwing a party for Sal, our local postal carrier, who had served for more than 30 years. 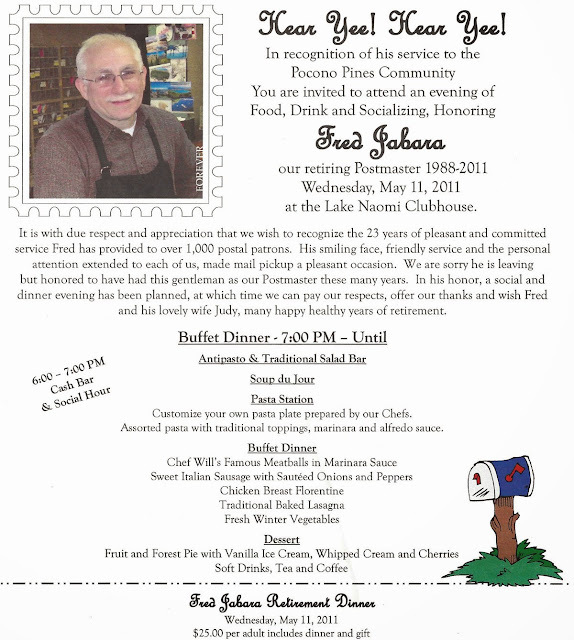 Has your community thrown a farewell party for your favorite local postal employee? Let us know in the comments! Okay, fair warningtechnically, you can now bank in it. My father recently purchased a nice cover (envelope) for our postmark collection, and I couldn't help but scan it in and post it for y'all when I saw it. I love New Deal-era post offices and I love post office building dedication covers. This particular example is a souvenir from the grand opening of a building that was completed in 1936. Westbrook, population 18,000, is located a couple of miles west of Portland, Maine's biggest city. The community's first so-named post office dates to 1881. Westbrook was one of approximately 20 communities in Maine to receive an all-new federally-funded postal facility during the FDR era. The Westbrook post office building was built along what is now Route 25, the town's largest thoroughfare, near the town's commercial district. Soon after the federal Treasury Department's Section of Fine Arts commissioned an oil-on-canvas mural to be installed in the post office lobby. The work, entitled "Woodsmen in the Woods of Maine," was painted by Waldo Peirce (December 17, 1884 — March 8, 1970) and installed in 1937. The work has since been relocated and can be found at the Portland Museum of Art. It appears to be well preserved and restored at least once. See a photo here. As is the case with many communities for which historic post offices were constructed during the former part of the 20th century, the Postal Service has since relocated and the New Deal facility is now privately owned. 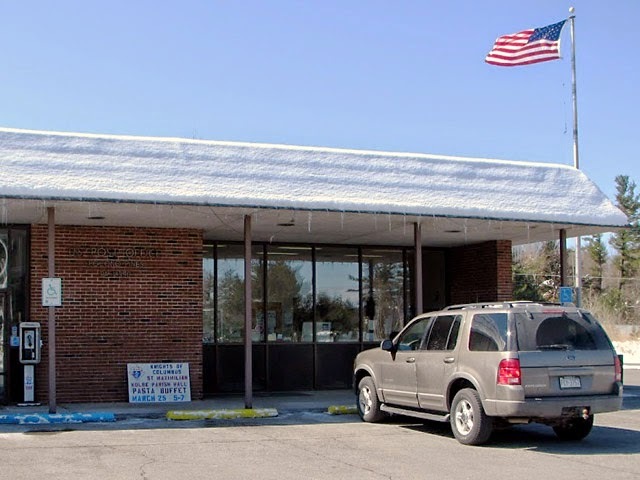 The current building housing the Westbrook post office is USPS-owned and was completed in 1978. Like other postal buildings of the era, it is utterly utilitarian and in no way distinctive. Regardless, we have a photo of it! This was taken by our friend J. Gallagher in 1990. 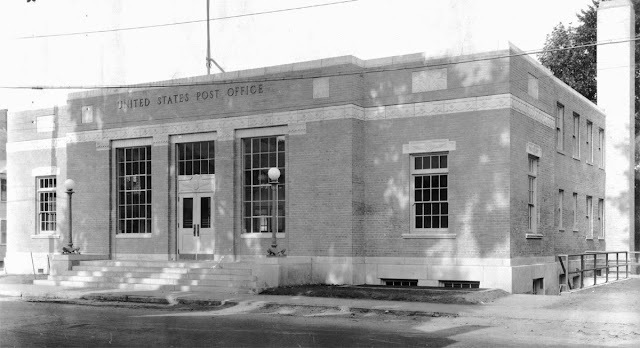 The 'new' post office is located just a few hundred feet east of the historic New Deal building, on Main St. The address of the former post office building was, according to old federal documents, 19 Brackett Street, though its address is now 17 Westbrook Common. This map will give you a sense of the development presently surrounding the historic post office building. The building is now occupied by a bank, the Ocean Communities Federal Credit Union. Thanks to the magic that is Google Street View, we can now see the repurposed post office complete with drive-through. From the looks of things (notably the recessed rectangle you can see at the bottom-front of the building), the Treasury Department cornerstone has since been removed.